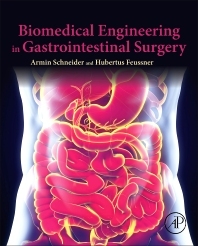 Biomedical Engineering in Gastrointestinal Surgery is a combination of engineering and surgical experience on the role of engineering in gastrointestinal surgery. There is currently no other book that combines engineering and clinical issues in this field, while engineering is becoming more and more important in surgery. This book is written to a high technical level, but also contains clear explanations of clinical conditions and clinical needs for engineers and students. Chapters covering anatomy and physiology are comprehensive and easy to understand for non-surgeons, while technologies are put into the context of surgical disease and anatomy for engineers. The authors are the two most senior members of the Institute for Minimally Invasive Interdisciplinary Therapeutic Interventions (MITI), which is pioneering this kind of collaboration between engineers and clinicians in minimally invasive surgery. MITI is an interdisciplinary platform for collaborative work of surgeons, gastroenterologists, biomedical engineers and industrial companies with mechanical and electronic workshops, dry laboratories and comprehensive facilities for animal studies as well as a fully integrated clinical "OR of the future". Dr Schneider is a biomedical engineer with 16 years’ experience in research and development. He received his master´s degree in Biomedical Engineering from Technische Universität München. He was awarded the European Radiology ESGAR Award in 2009, and the Boston-Scientific-Innovationspreis award in 2010. He has contributed to over 50 articles, has a H index of 30 and is a frequent conference presenter. Both he and Dr Feussner are members of several international scientific associations like CARS and SMIT. Professor Feussner is a senior consultant surgeon who has been doing minimally invasive surgery for 30 years. He is a pioneer in laparoscopic and minimally invasive surgery which he introduced into clinical practice in 1989. In 1999, Professor Feussner established the Institute for Minimally Invasive Interdisciplinary Therapeutic Interventions (MITI). He is the Secretary General of the Section for Computer and Telematic Assisted Surgery (CTAC) of the German Surgical Society since 2001 and of the German Society for Dysphagia (DGD). He is an Honorary Member of the Hungarian Society of Surgeons and other international surgical societies. He has authored more than 300 peer reviewed articles and holds 9 international patents.